Audi TT RS revealed | What Car? This is the Audi TT RS, which is powered by a turbocharged 340bhp 2.5-litre engine. 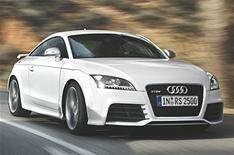 The highest-performance Audi TT is available as a coupe or roadster, and goes on sale in March. No prices have been announced, but it is expected to be below 45,000. Helped by the car's four-wheel-drive system, the coupe goes from 0-62mph in just 4.6 seconds, while the roadster takes 0.1 longer. The top speed of the standard car is limited to 155mph, although buyers can opt to have this raised to 174mph. The engine is linked to a six-speed manual gearbox and provides 332lb ft of pulling power. The coupe averages 25.57mpg, while in the roadster manages 24.8mpg. The car's body is 10mm lower than the standard TT's, and bespoke shock absorbers and springs enhance the handling. Buyers can specify magnetic ride adaptive damping, which allows them to switch the shock absorbers between dynamic and comfort modes. Drivers can also press a sport button, which makes the exhaust note raspier. Alternatively, buyers can specify a sports exhaust system that improves power and increases noise. The stability control system can also be switched off partially or entirely to enhance driver enjoyment. The car is fitted with 18-inch wheels as standard. Highlights include an instrument panel that can display boost pressure, oil temperature and a lap timer for use on racetracks. Automatic climate control, heated sports seats, and a high-quality sound system are also provided as standard. Options include different styles of 18-, 19- and 20-inch alloy wheels, and bucket seats with folding headrests.